Rugby is a fast moving game that involves a lot of physical contact and it's more than likely if you play the game regularly you'll end up with one type of injury or another. Upper and lower limb muscle strains and injuries are common as are finger and hand injuries. The scrum if it collapses is an area where extremely serious injuries to the back and neck can happen .Where rugby differs from sports like football is the amount of upper body contact that takes place during a game. It's normal for players running at pace to be charged into and tackled with considerable force. Studded rugby boots. (These boots must be fitted with rugby safety studs). Headgear is compulsory for junior players but not for seniors, although in some parts of the world- like Japan- the wearing of headgear is mandatory. Headgear is worn to protect the player from cuts and bruises to the scalp. It's also claimed the wearing of headgear will reduce the risk of concussion, although there is no medical proof that it does so. Unsurprisingly head injuries account for 25% of all rugby injuries. Knee injuries are common and are the area where most severe injuries take place. As well as the normal strains, medial ligament damage is very common. Hand and finger fractures regularly occur. Dislocation of the shoulder is fairly common. Hamstring injuries are the most frequent thigh injuries. Neck injuries also happen fairly often. Twists and strains and whiplash type injuries being the most regular type of neck injury. If we look at when injuries take place during a game we find that the majority happen in the last third of a match. There's no doubt that fatigue plays a large part in these injuries. As muscles get tired muscular output force drops and they find it harder to protect themselves and surrounding ligaments and bones. There's also a suggestion that the lack of a proper warm-up at the start of the second half may contribute towards the high rate of injury during the second half of games. With the knee being the area where the most severe injuries happen, and the leg in general being injured frequently we can try and reduce the risk of injury in this area by targeting the legs for specific training. Coordination training on rocker or wobble boards should be done regularly. Try one leg strengthening movements like, one-leg squats or one-leg hops. High bench step ups, or bench hops. Sprints and explosive strength training such as diagonal runs with cuts, lateral hops and high knee explosions will also help strengthen the legs and knees. To help reduce hamstring problems bicycle leg swings can be employed. While this is by no means an exhaustive list, it may help you build the strength in your legs that will prevent you picking up injuries late in the game. 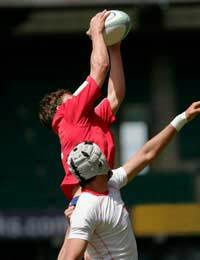 Rugby should be played withouts any equipement at all.